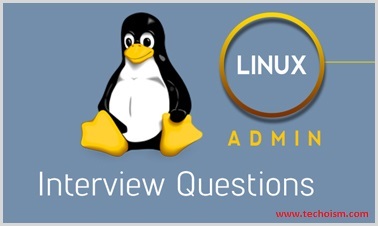 In this article we are going to discuss some linux system admin interview questions with the answers for experience professionals. Below mentioned questions may help you to clear Linux interviews. Q:1 Why LVM is required? Ans: LVM stands for Logical Volume Manager. It’s help to resize the filesystem’s size online on Linux. Easily we can extend or reduce the size of LVM partition using the lvextend & lvreduce commands. Q:2 How To check Memory stats and CPU stats? Ans: By using ‘free’ & ‘vmstat’ command we can display the memory statistics physical and virtual both. Also with the help of ‘sar’ and ‘top’ command we can display the CPU utilization. Q:3 What does SAR provides and at which location Sar logs are stored? Ans: System Activity Reporter (SAR) is an important tool that helps system administrator to get a review of the server machine with status of different critical metrics at different points of time. Using sar you can monitor performance of different Linux subsystems (CPU, Memory, I/O..) in real time. The default log file location is /var/log/sa/. Q:4 How to increase the size of LVM partition? Q:5 How to reduce or shrink the size of LVM partition? – Umount the filesystem using umount command. – Now reduce the filesystem using the lvreduce command. Above Command will shrink the size & will make the filesystem size 20GB. Q:6 How to create partition from the raw disk? – After creating partition , press w and hit Enter to write the changes to the partition table. Q:7 Where the kernel modules are located? Ans: The default location of kernel modules is ‘/lib/modules/<kernel-version>/’. Also with ‘lsmod‘ command, we can see all the installed kernel modules. Ans: umask stands for ‘User file creation mask’. The user file-creation mode mask (umask) is use to determine the file permission for newly created files. Q:9 How to set the umask permanently for a user? Ans: You can change your default umask value by changing value in /etc/profile. If you want to set umask value for any specific user then you can change in ~/.bash_profile or ~/.bashrc file. Q:10 How to change the default run level in Linux? – Edit /etc/inittab file to change the default run level. – Check the default run level using mention command. – Change the default run level. Q:11 How to share a directory using NFS? Add an entry like below. Q:12 How to check and mount nfs share? Q:13 What are the default ports used for SMTP, DNS, FTP, DHCP, SSH, and squid? Q:14 What is Network Bonding? Ans: Network bonding is a process of combing or joining two or more network interfaces together into a single interface. Network bonding is also known as NIC Teaming. Q:15 What are the different modes of Network bonding in Linux? Q:16 How to check and verify the status of the bond interface. With the help of above command, we can easily check which mode is enabled and what LANcards are used in this bond. Also in the same time we can configure multiple bond interface like bond1,bond2 and so on. Q:17 How to check the default route and routing table? Ans: Use ‘netstat -nr’ and ‘route -n’ command to check the default route and routing tables. Q:18 How to check which ports are listening in my Linux Server? Ans: Use ‘netstat –listen’ and ‘lsof -i’ command to check listening ports. Q:19 List the services that are enabled at a particular run level in Linux server? Ans: We can using mention commands to list all the service that is enabled. Q:20 How to enable a service at a particular run level? Q:21 How to upgrade Kernel in Linux? Ans: We can’t upgrade Linux Kernel, we always install the new New kernel using rpm or yum command. Q:22 How To scan newly assigned LUNS on Linux box without rebooting? Q:23 How to find WWN numbers of HBA cards in Linux Server? Ans: We can find the WWN numbers of HBA cards using ‘systool -c fc_host -v | grep port_name’ command. Q:24 How to add & change the Kernel parameters? Ans: Edit /etc/sysctl.conf configuration file to set or change the kernel parameters in linux and after making the changes run ‘sysctl -p’. We don’t need to reboot the service. Q:25 What is Puppet Server? Ans: Puppet is a configuration management tool that is used in deploying, configuring, managing, maintaining, a server machine. Puppet keeps the configuration of your hosts under check and can be used in one shot to configure a machine like installing package, editing and configuring, create and manage users required etc. The main added advantage is that you can manage the configuration of almost all open-source tools available out there, using puppet. Q:26 What are manifests in Puppet? Ans: Manifests in Puppet are the files in which the client configuration is specified. Q:27 Which Command is used to sign requested certificates in Puppet Server? Q:28 At which location Puppet Master Stores Certificates? Q:29 How to find all the regular files in a directory? Ans: Using find / -type f command. Q:30 What is load average in Linux? Ans: Load Average is defined as the average sum of the number of process waiting in the run queue and number of process currently executing over the period of 1,5 and 15 minutes. Using the ‘top’ and ‘uptime’ command we find the load average of a Linux sever.